Mashable is set to unveil a beta launch redesign on Wednesday (Nov. 14) aimed at putting the social media-centric publication at the center of both the data-driven publishing and native advertising movements. On the ad front, the site will adopt an infinite scrolling mechanism, designed to only serve "below the fold" ad units when a reader actually scrolls down the page. That will help Mashable make the argument to advertisers that it only serves viewable impressions—a standard many in the online ad world hope becomes commonplace, as the industry strives to adopt a common ad currency. In addtion, Mashable has rolled out what it's calling a "storytelling ads unit." This ad treatment allows brands to buy multiple units on one page, which in conjunction lay out a single narrative as a reader scrolls down the page. Besides rethinking its ad inventory, Mashable is looking to further its social publising prowess by relying more heavily on data in deciding what content it publishes, and when. To that end, the company has adopted a "velocity algorithm," i.e., a predictive set of tools aimed at monitoring all of Mashable's content for signs of virality—and then reacting instantly. Using the new algorithm, Mashable says it can now automatically promote its most viral-oriented stories on the site's main page via a new The Next Big Thing widget. The hope is that Mashable's velocity algorithm can identify viral content in almost real time (before it actually goes viral), and then recommend the content to Mashable's readers, creating a self-fulfilling prophesy of sorts. "One thing media has struggled with is finding the next story to show the reader," said Mashable CTO Robyn Peterson. "The algorithm, with very little data, can tell us the social opportunity of the article, which we can then give the reader to keep them ahead of the curve." 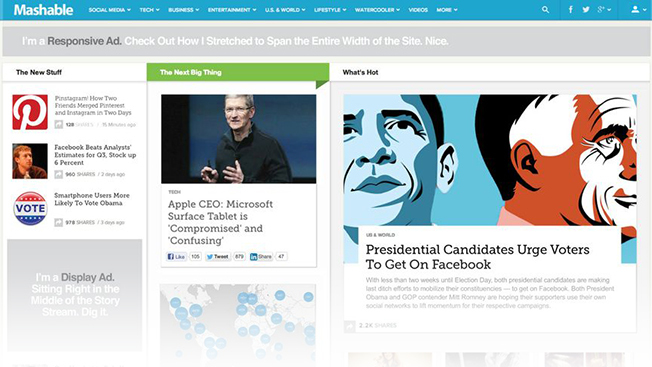 "This is more of rethink of the Mashable site and platform, rather than a simple redesign," Peterson added. Indeed. Looking to capitalize on the highly social nature of the site, Mashable's teams are also attempting to better leverage user surfing habits to make more informed editorial decisions. For example, "we noticed internally that when we share a very large, rich photo with a link, we see eight times the engagement," Peterson noted. "We know now from our data that big image searches are at the core of the new search evolution, so we made it a key element in the site." That's not to say that all this tech-driven publishing signals the begining of the end for Mashable editors. Starting Wednesday, staffers will start selecting what they consider the most sharable nuggets of each story. A new widget will the enable readers to export that content straight to social networks (think sharable magazine pull quotes).